On Monday 5 November art students from the University of Bolton and Bolton College (UoB) worked with Bolton Council’s Waste and Recycling team to inspire people to recycle clothing and reusable items. The ‘ReClaim, ReWork, ReUse’ project, sponsored by Bolton Council featured around 200 pieces of art made from discarded plastic, cardboard and carrier bags. Bolton College students produced body adornments using materials provided by the council, including antique vinyl records, wires and household rubbish. The pieces were judged by the Mayor of Bolton, Councillor Elaine Sherrington, Acting Principal of Bolton College, Bill Webster and Head of the School of The Arts at the University of Bolton, Sam Johnson. 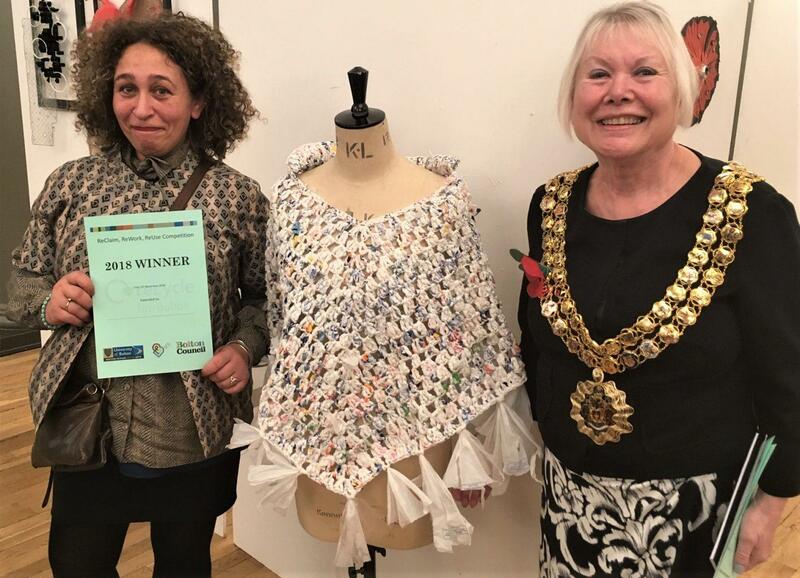 After much deliberation, the winning piece was a poncho made entirely of plastic carrier bags, which had been painstakingly crocheted by Annabelle Totty. Textiles and Surface Design Lecturer at UoB’s School of the Arts, Rachel Dawson, who organised the project and exhibition was delighted and proud with the end result.